After a last place finish in the Big Sky, Sacramento State is in need of some hope. They hope their four-man recruiting class will provide that. The best of the bunch appears to be Dylan Garrity, who is also the only freshman recruit the Hornets are bringing in. At 6'2'', he is a solid all-around guard that will likely be asked to play a lot of minutes right away. He averaged at least 17 PPG each of his last three years of high school, including 20.6 PPG his senior year. He also had 3.7 APG, 3.7 RPG, and 1.8 SPG. He is a solid outside shooter (45% from downtown). 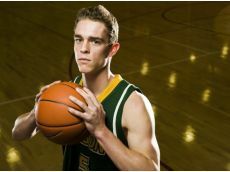 He was all-state twice in high school, and holds his school record for points and assists. If the program is going to turn around under Brian Katz, Garrity will likely be behind it. They also signed 3 JUCO guys. One of them is Anthony Costentino, who is 6'7'' and played at Southwestern College in Chila Vista, CA last year. He was named the conference MVP both of his years there, and last year put together a line of 18.7 PPG AND 6.9 RPG. He is dangerous from everywhere on the court, as he shot a respectable 38% from beyond the arc. “Anthony is very versatile player who has perimeter skills and can go inside and post up,” says Brian Katz. “He comes from a basketball family and has grown accustomed to winning at every level he has played.” He figures to be in the mix for playing time at the 3/4. Another G/F combo is Joe Eberhard, who comes to Sac-Town after playing two years at Irvine Valley JC. Last season he averaged 11.1 PPG and 6.3 RPG. He is a very versatile player, and could see some minutes at a couple of different spots for the Hornets. The last guy they brought in is combo guard Jordan Estrada, who played at Diablo Valley JC in Concord, CA. He averaged 13.2 PPG to go with 1.8 APG last year. He also showed a propensity to hit the deep ball, making 40% last year. He will be in the rotation for minutes at the guard spots, though he doesn't look to me to be a starter. What do you think of the class? Who is the best, and what do you expect from them?